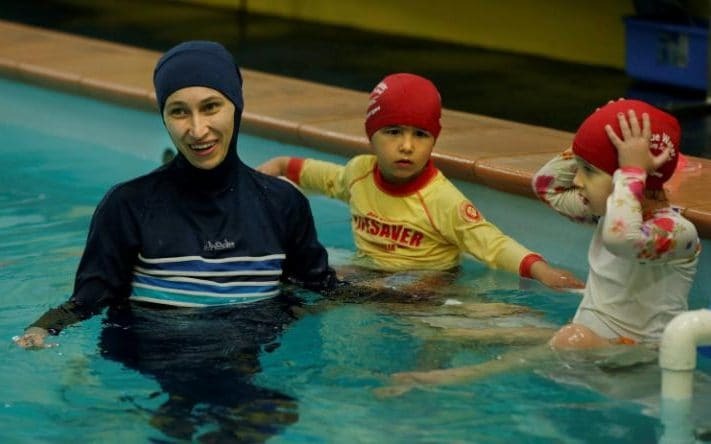 Germany’s highest court has ruled that Muslim girls must take part in swimming lessons alongside boys. According to a report covered by Mashregh News in Farsi, Germany’s constitutional court ruled that Muslim schoolgirls must take part in mixed swimming lessons together with boys. But the court ruled that schools have a duty to encourage “social behaviour” and are entitled the make the lessons compulsory, and that mixed swimming lessons are “not a serious impairment of religious freedom”. While some other pupils at the school chose to wear burkinis to the lessons, the girl who brought the case refused, arguing the costume did not provide sufficient coverage, Telegraph reported. The court’s apparent endorsement of the burkini comes just two days after Angela Merkel added her voice to calls for a partial ban on the burka in German public life.